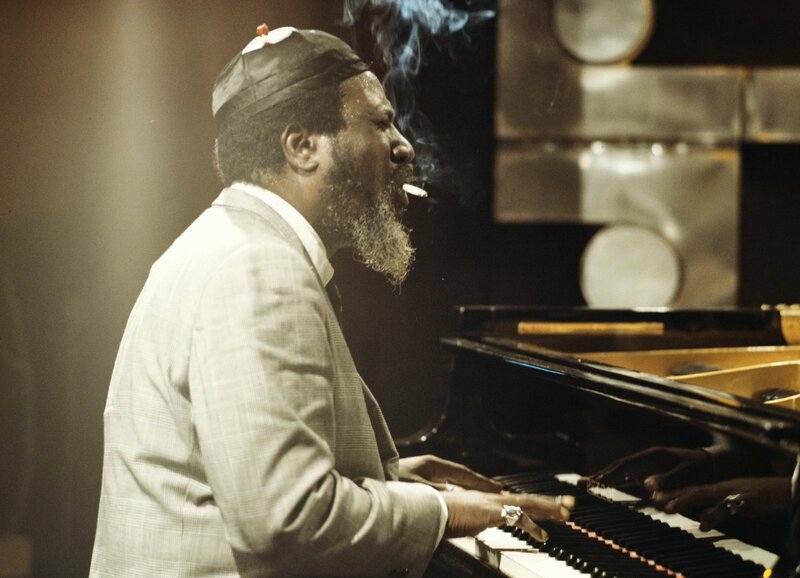 Thelonious Sphere Monk was born October 10, 1917. 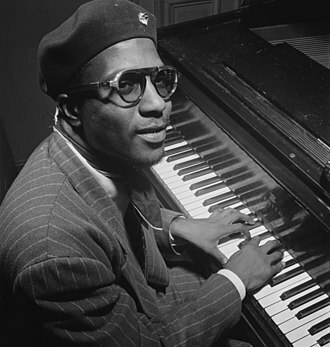 He is one of the pillars of American jazz, the pianist and composer had a unique improvisational style and made numerous compositionial contributions to the standard jazz repertoire, including: “‘Round Midnight,” “Blue Monk,” “Straight, No Chaser,” “Ruby, My Dear,” “In Walked Bud,” and “Well, You Needn’t.” Thelonious Monk, more commonly referred to as just Monk, is the second most-recorded jazz composer after Duke Ellington, which is particularly remarkable as Ellington composed more than a thousand pieces, whereas Monk wrote about 70. Monk’s compositions and improvisations feature dissonances and angular melodic lines that twist and turn, but always have catchy and melodic weight that is stunning. His approach to playing the piano was equally creative, combining a highly percussive attack with unexpected, dramatic use of switched key releases, silences, and hesitations. Monk was renowned personality and dressing habits too. His distinctive style in suits, hats, and sunglasses became is trademark. His idiosyncratic habit during performances was equally unique: while the other musicians in the band continued playing, he would stop, stand up from the keyboard, and dance for a few moments before returning to the piano. Monk was born in Rocky Mount, N.C., but when his family moved to New York City when he was five is when started playing the piano a year later. Monk never finished high school, instead following his musical gift, went on the road backing an evangelist. Monk suffered from a form of mental illness that worsened in the late ’60s. He spent the last decade of his life as a guest in the Baroness de Koenigswarter’s mansion in New Jersey, where he died of a stroke in 1982 at the age of 64. Monk is the epitome of jazz. That’s the short of it! This year marks what would have been the 100th birthday of Monk, and to celebrate, Craft Recordings has assembled a new, limited-edition vinyl box set, The Complete Prestige 10-Inch LP Collection (Due out December 15, 2017), the collection includes all five of the 10” vinyl LPs which the pianist recorded for the jazz label. The dates covered are 1952 to 1954 and eacg album has been faithfully reproduced – from the jacket design to the LP labels – while the audio has been carefully restored and remastered by Joe Tarantino from the original analog tapes, with lacquer cutting by George Horn and Anne-Marie Seunram at Fantasy Studios. Rounding out the collection is a booklet with new liner notes by Robin D. G. Kelley, author of Thelonious Monk: The Life and Times of an American Original. The groups feature an impressive collective personnel that includes some of jazz’s finest (Sonny Rollins, Max Roach, Art Blakey and Percy Heath, among them). “Listening to these tracks more than sixty years after they were recorded, it’s stunning how compelling, modern and original Monk’s music still sounds, even through the filter of 21st-century ears,” observes the collection’s producer, Nick Phillips. “That’s the mark of a true musical genius, indeed.” The Complete Prestige 10-Inch LP Collection will also be released in high-res and standard audio formats across all streaming and digital platforms. 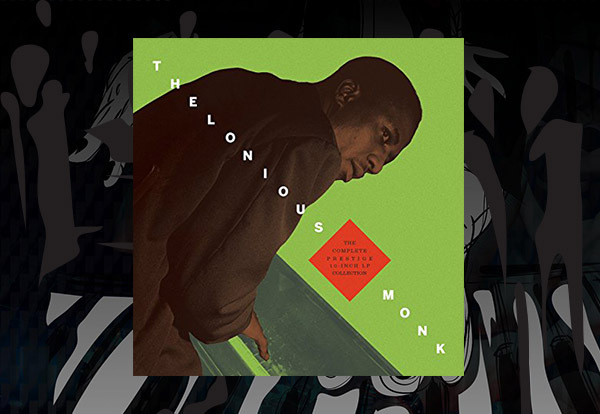 The box set includes the following 10” LPs: Thelonious Monk Trio, Thelonious; Thelonious Monk Quintet Blows For LP, featuring Sonny Rollins, Thelonious Monk Quintet; Thelonious Monk Plays and Sonny Rollins and Thelonious Monk.